The consequences of spondylolisthesis can cause pain or enact related neurological or functional issues in the spinal column. Spondylolisthesis is not inherently painful or problematic, but the results of the condition can certainly be both. Since all types of listhesis change the normal and ideal structural layout of the backbone, it is expected for other related collateral consequences to follow in some patients. The effects of spondylolisthesis are usually divided into 2 separate categories. There are effects on the spinal anatomy itself, often resulting in changes to other tissues or the functionality of the vertebral column. These category 1 changes are not inherently painful, although they can be. There is also the second category of changes that affect the patient directly through pain or through limitations on normal life activities. This resource section profiles the most common consequences of listhesis conditions in the human spine. It is vital to understand that none of these consequences is inherent to the existence of spondylolisthesis, but that all might be possible results for some patients and some conditions. Are There Always Consequences of Spondylolisthesis? Let’s begin this essay on a positive note. Given proper diagnosis and monitoring, most patients will not require treatment or the need to implement any special lifestyle restrictions due to the vast majority of spondylolisthesis conditions. This includes virtually all grade 1 and 2 cases, which account for over 90% of patients. Grade 3 and 4 cases will not inherently generate negative health effects, but they might; so patients must be carefully prepared for the possibility of these consequences. However, doing so puts these patients at great risk for the development of mindbody pain syndromes, especially in currently asymptomatic patients, so great care must be taken by doctors when it comes to bedside manner. Listhesis does influence the surrounding spinal anatomy, as the entire vertebral column is interrelated in form and function. This includes contributory effects on spinal bones, discs, ligaments and neurological tissues. Therefore, the worse the structural changes are in the listhesis presentation, the more they might negatively affect the surrounding tissues of the backbone. However, this is not a given, as the spine is very accommodating to structural changes and can often balance itself despite significant alteration in form or function. Suffering a pinched nerve from spondylolisthesis is certainly possible, since listhesis tends to misalign the neural foramen and might even contribute to structural compression of the nerve root. Spondylolisthesis foraminal stenosis is almost always diagnosed in association with severe cases of vertebral slippage. Spinal stenosis from spondylolisthesis involves similar scenarios as those of pinched nerves. Listhesis can misalign the central vertebral canal and also contribute to compression of the cauda equina or even the spinal cord when the vertebral slippage occurs high enough in the backbone. Can spondylolisthesis cause a herniated disc? Yes, in fact, it can. When vertebrae migrate, discs suffer stress at their attaching endplates and this stress can contribute to desiccation and herniation. Spondylolisthesis pain while sitting is usually most prevalent when first sitting down from a standing position or when rising from sitting to a standing posture. Pain that occurs when seated comfortably is rare consequence of most listhesis issues, but might be related to resulting disc or bone abnormalities. Spondylolisthesis pain while standing is much more common, with many patients enduring their worst symptoms when maintaining an upright posture. Spondylolisthesis disability might be a consequence of the worst cases of listhesis, generally in the grade 3 and 4 categories. Most people should not expect disability as a consequence to any listhesis condition, barring the most clinically extreme. Spondylolisthesis spinal instability is one of the worst consequences of spondylolisthesis. Very severe slippage can imbalance the entire vertebral column, creating gaps in its overall strength and functionality that can compromise structural integrity. Spondylolisthesis spinal cord injury can only occur in areas where the cord is still present in the region of vertebral migration. Since most cases of spondylolisthesis occur in the region between L4 and S1, spinal nerve injury may occur, but cord trauma is anatomically impossible. Spinal cord injury is most commonly associated with rare cervical spondylolisthesis. 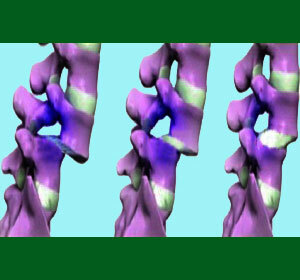 Spondylolisthesis paralysis is perhaps the worst clinical result of a listhesis issue. In most cases, grade 4 listhesis exists and contributes to dramatic trauma of the spinal cord or multiple spinal nerve roots. Spondylolisthesis hyperlordosis and hypolordosis conditions can exist in association with anterolisthesis and retrolisthesis respectively, in the cervical or lumbar spinal regions. Spondylolisthesis in the elderly is more common than in other age demographics. Some elderly-related listhesis is a direct result of spinal aging, while other cases have existed for a log time due to other factors, but might worsen in the advancing years of life. Spondylolisthesis in children is most common in active, athletic kids and especially teens. Injury to the pars interarticularis is a common cause due to repetitive stress over time. Obesity and spondylolisthesis are a bad mix. Being overweight is known to be one of the most serious symptomatic exacerbators. Spondylolisthesis and pregnancy also poses unique challenges for some women, as pregnancy can off-center anatomical gravity, change spinal curvatures and contribute to increased forward slippage of anterolisthesis problems. Rarely, pregnancy is cited as a direct contributor to the development of spondylolisthesis. It is crucial to keep things in perspective when analyzing listhesis conditions from a clinical point of view. It is certainly possible for patients to experience a wide range of negative collateral effects as direct results of contributory consequences of spondylolisthesis. However, these cases represent the minority of diagnosed patients and usually include profiles of grade 3 or higher. Most minor to moderate cases of listhesis, including virtually all grade 1 and 2 conditions are and should remain asymptomatic. Additionally, there are plenty of asymptomatic grade 3 cases and even some grade 4 profiles that remain painless and basically exist innocuously in the background of life. Care providers must be very careful not to impose nocebo effect when managing patients, as it is a fine line between cautioning them on risky activities and making them feel damaged and physically limited. Doctors are encouraged to be mindful of their words when discussing diagnosis, treatment and lifestyle choices so as to encourage patients to be as active as possible, given their specific conditions, and to keep them free from pain that might be related to the mindbody process, rather than actual structural abnormality.